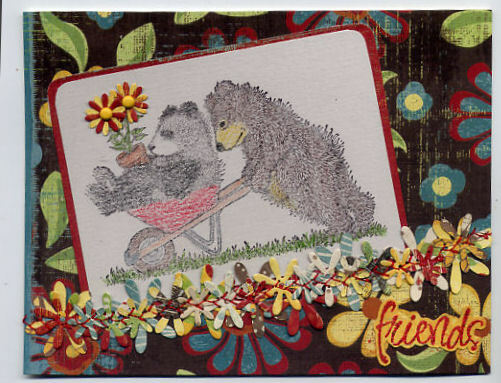 Friends Challenge I stamped and used colored pencils on the image from Stampabilities and placed Daisys over the flowers that was cut with their Darling Daisies die. I also cut a bunch of daisys out and made a border for the card, just laid a bunch down and stitched over them. Thanks for stopping by! Adorable card, Joy. What a cute image. Good luck and thanks for joining in on the fun at Cheery Lynn Designs challenge blog. Certainly a gorgeous card, and I love how you designed it.... wonderful to have you join in the Cheery Lynn Designs challenge this week! Such an adorable card, Joy! Love it! From your posts I gather that you like pink! Please if this is the case, join us on Saturday's to share your work on Beverly's Pink Saturday page! Thanks for visiting my blog, I appreciate it! I hope you come more often!